This room’s the greatest arsenal we could have. OK, we’re not the Intergalactic Library but we do have books about improving your business and some interesting White Papers. We’re asking for nothing in exchange – no email opt-in or subscribe – just click the Download button and you’ll get the download straight away. So, go on, arm yourself for business! 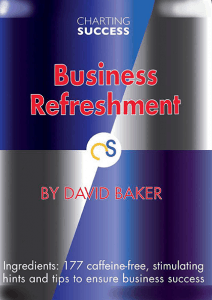 Would you like to refresh your business? Do you want to stimulate some fresh thinking and new ideas? Well have a taste of some of these caffeine-free, stimulating business hints and tips and get some added boost for your business performance. Like any good recipe it contains some tried and trusted ingredients but for those wanting that extra, techno-boost there are sections on websites, e-mail marketing and business networking. So if you want a real ‘kick’ to get your business speeding along the road to success, try some – forget the caffeine, this is all the rush your business needs. The new EU GDPR came into force on the 25th May 2018 (irrespective of Brexit). How it might affect you and your business? Do you know what you need to do about it (and when)? A simple guide to a practical, pragmatic personal password policy. Policy – Because if you have a policy you don’t have to think about what to do next! 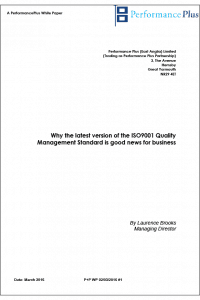 The ISO 9001 international Quality Management Standard has provided a framework for business measurement and improvement for nearly 30 years, the latest 2015 edition continues this overall system with significant new additions to enhance the achievable outcomes. This paper outlines what the key differences are and how they can have a positive impact on your organisation and its future development. This book is written by a specialist construction subcontractor (OK, ex-subcontractor) for specialist construction subcontractors. Why, because he believes that in the brutal world of construction subcontracting, specialists, of any size and any sector, can benefit enormously from Quality Management and Quality Management Principles and indeed from securing ISO Certification (i.e. being independently assessed) to the International Standards that the industry increasingly demands, namely ISO 9001 (Quality Management), ISO 14001 (Environmental Management) and OHSAS 18001 (Health & Safety Management). Accreditation to these Standards can cut-through the current bane of subcontractor’s lives — filling in pre-qualification questionnaires (PQQ’s). Not just filling them in either, ISO Certification greatly increases your chances of getting on that next tender list from a particular customer who doesn’t currently work with your business. Certification normally allows you to sail through most of the PQQ’s and let’s face it, they are not going to go away. Ensuring the quality of the supply chain is becoming increasingly important for employers of specialist suppliers and subcontractors and there seems to be no choice other than for these businesses to get professional about assuring their potential customers. 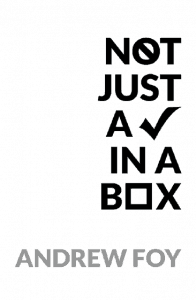 ISO Certification, however, is certainly Not Just a Tick in a Box on a PQQ.